Preheat oven to 350 degrees F (175 degrees C). Grease a pie dish. 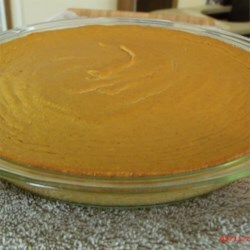 Beat pumpkin puree, milk, sweetener, egg substitute, vanilla extract, cinnamon, ginger, and nutmeg in a bowl until smooth; pour into prepared pie dish.